Time and Place Connections features a display of artifacts from the specific time period being studied, so students can see how the events and attitudes of that time influenced the art that was created. It includes an activity that relates to the topic under discussion. Your Portfolio provides a multi-step portfolio activity that correlates with chapter content so students have frequent opportunities to add relevant, chapter-specific projects to their portfolios. Focus on the Arts provides students with an overview of the literature, theatre, music, or dance that was poular during the corresponding artistic period they are exploring in the text so they can examine artistic influences and interpretations from a number of different perspectives. 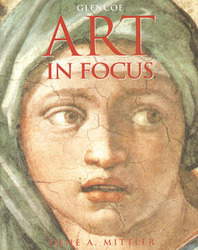 Looking Closely highlights selected pieces of art and provides easy-to-read details about the artwork to help students and teachers analyze and understand what they see. Studio Lessons encourage students to explore one specific artistic discipline by examining a related inspiration, studying the process, and then creating and evaluating their own work using that discipline. Art and . . . provides cross-curricular connections between the arts and science, language arts, math, and social studies, so your students can recognize how these disciplines influenced the art of the period. Symbolism in Art highlights areas within a showcased work of art and describes what the elements within the work might symbolize, to help students examine the "message" behind some of the world's greatest artistic treasures. Internet Connections lead students to more detailed information about chapter topics to help them build their Internet skills as they broaden their understanding. Technology Projects at the end of each chapter provide a number of student projects that give students the opportunity to use CD-ROM, laserdisc, multimedia, and Internet technology. The Careers in Art feature directs students to the Careers in Art Handbook, where they can read about a career that utilizes one of the skills covered in the previous chapter, so students understand how their studies relate to the world of work. Artsource® directs students to the Performing Arts Handbook, where they can find detailed information about particular artists and their craft.